Two weeks ago, there was a local BrewFest that was much anticipated until we realized that the entrance fee was $25 and didn't come with any free brews. When the day came, a few friends and I decided to avoid the crowds and drop the same amount of money on a whole bunch of microbrews in a Make Your Own Sixer and have our own beer-tasting Brewfest. We all filled our sixers with three beers we'd tried and wanted to share and 3 mystery picks. (If you're a beer drinker, I highly recommend you try this at home). Since this was the last minute decision of a bunch of broke people, we had not planned on food. Luckily I had the pieces to throw together some thin crust pizza. 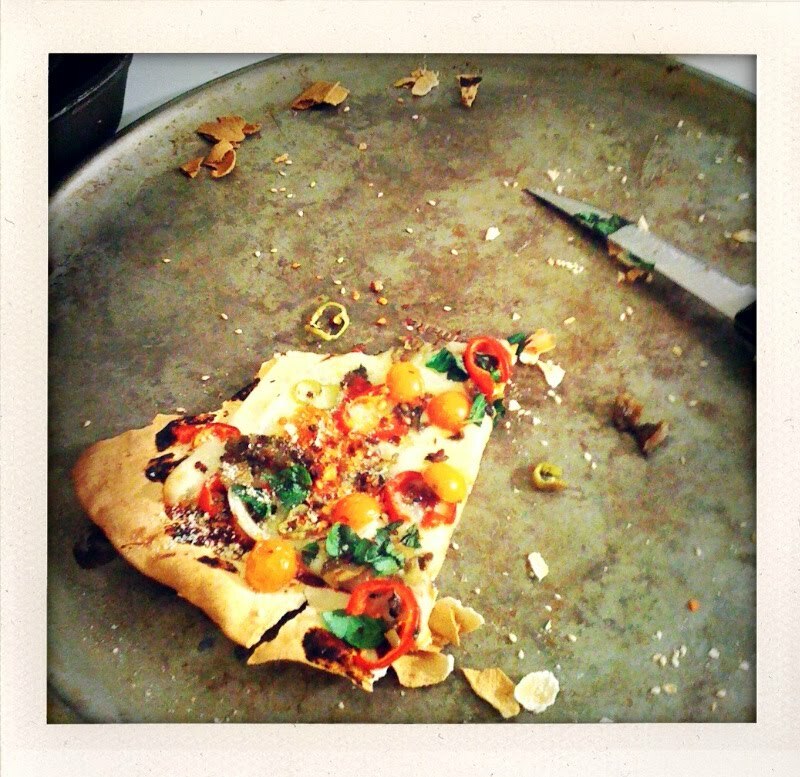 I used a large Lahvosh Cracker for the thin crust and I spread some tomato paste and sprinkled a tsp of dried oregano on the cracker. 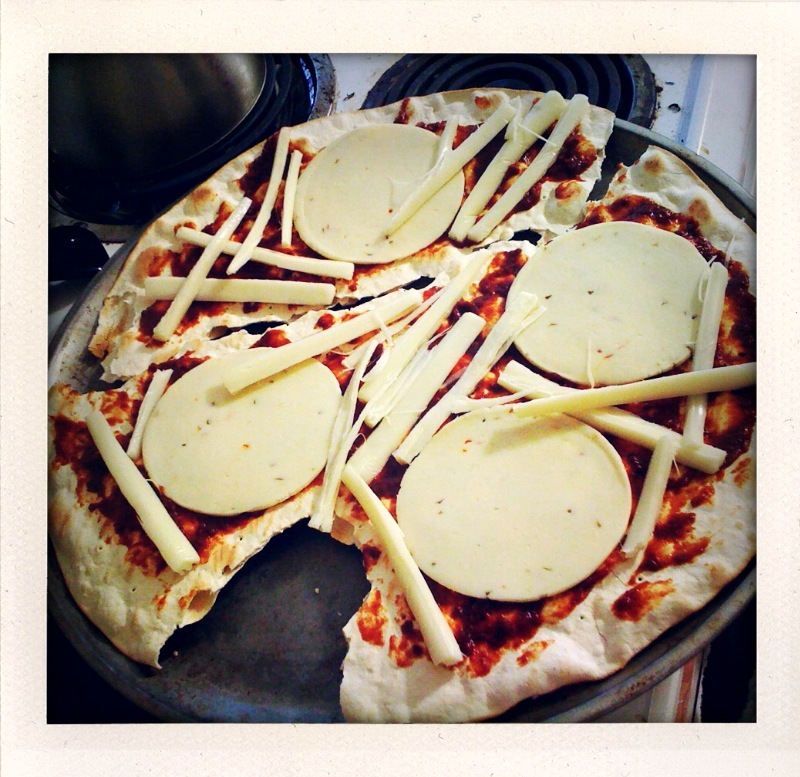 I had some mozzarella string cheese, so we peeled 3-4 and positioned them in between round slices of pepper-jack cheese. I then topped it with some peppers, halved sungold tomatoes, roasted eggplant and olives. I cooked it in the oven @ 350F for 10 minutes and then topped with some chopped fresh basil and some take-out packets of crushed red pepper and parmesan. It turned out to be a nice little pie. The two cheeses oozed together and sheathed the whole pizza and the thin crust left plenty of room for beer and some late night seconds. Of course, you can put whatever you want on your pizza and use whatever type of crust, sauce and cheese. This mix was good for us, but it was all we had in the house -luckily summer has provided us with a fridge full of veggies from the garden.